On this day, I will share a look and the tutorial, which I made to celebrate this day and what else can be to throw some colors on the eyes. In this look here, I have used all the four colors that we find in our national flag i.e Orange, green, blue and white. I wish the weather wasn’t that gloomy that day as in the pictures, the colors appears dull which were bright and had more dimensions in person but nevertheless this was to celebrate our independence day so that’s fine!! 1- I primed my eyes and applied a dark green eye shadow over the crease and into the eye socket. 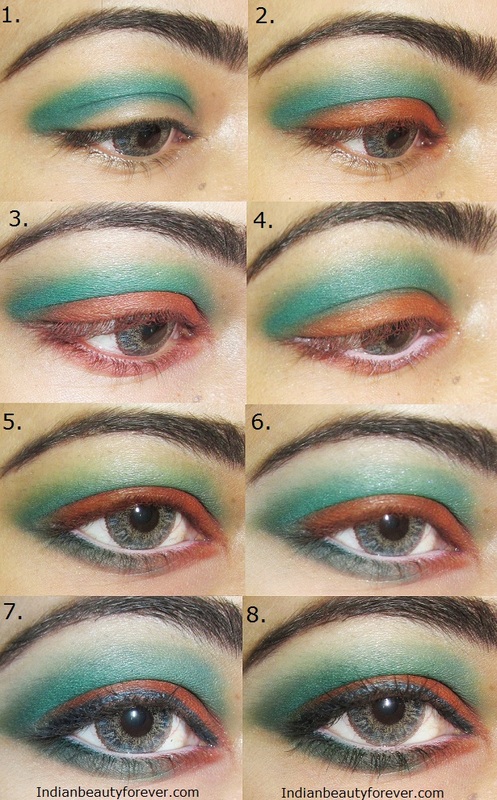 2- Then I used an orange shade on the lids but did not blend them as they could have made an intermediate color. 5- Now, I bring the same green from the outer corner of my eyes towards the lower lash line and dragged it till the middle. 6- I used some more green and a white shadow on the brow bone. 7- I used a navy blue pencil from faces Canada to line my eyes, only close to the upper lashline, just the thin line. 8- I completed with a single coat of mascara. I created the look just to show you the step and also you may also customize it as per your convenience not just the colors. for eg- you can keep the green and instead of orange use a gold color to create a smokey green effect and skip the eye shadow below the lower lash line and god for a thick eyeliner. 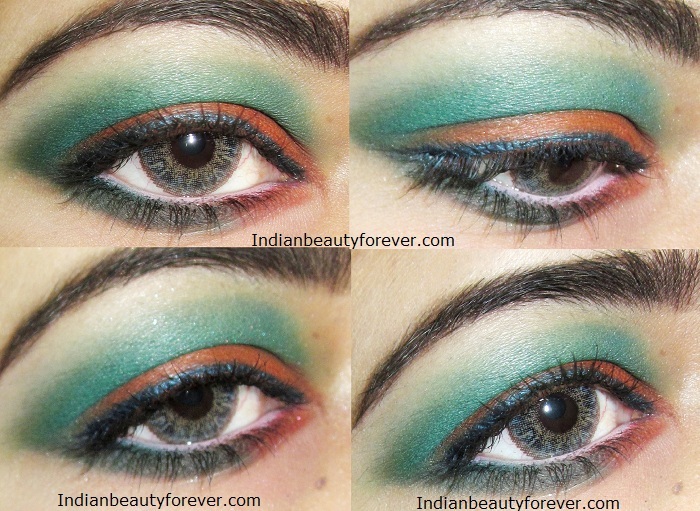 Hope you liked this Eye makeup tutorial with Orange and green! Have a great day ahead and Happy independence day once again!! sooo.................. beautiful i hope i learn only 10 % of this !!!!!!!!!! Loved the green! Happy Independence day to you! Mera Bharat Mahaan! Nicely done Niesha! Thank you Nisha! Jai Bharat! Thank you Shikha!! I will definitely check dear! thats pretty!!! did you wear this yesterdy? Thank you Jeeshan!! :) No, it was more like a tribute thing! Thank you so much Swati!!! Thank you so much Pearl!! Aaaahhh such a beautiful look ...<3ed it... Awesome Niesha ! I will definitely follow you too! Oh sorry Niesha, I placed my bloglink, I'm awfully sorry. No worries Orianne! :) I don't allow the click able links.